So I did a search on this pump to see what people have found when installed in our cars. I was unable to find information with numbers just for this pump. Seems everyone brings in other pumps. I also researched this pump form other forums and on other cars and seems to do well. I have this pump, but do not have my car running yet. I would like to have anyone running this pump please give feead back good or bad. List what numbers you see as well as injector size and HP numbers. It works great, I'm using it, over 500 hp, 24 psi boost, 44 base fuel pressure, 850's and 1680s, stock fuel lines except for the 6an lines to and from the aeromotive fpr. Logging fuel pressure and afr. Others have used it on here. 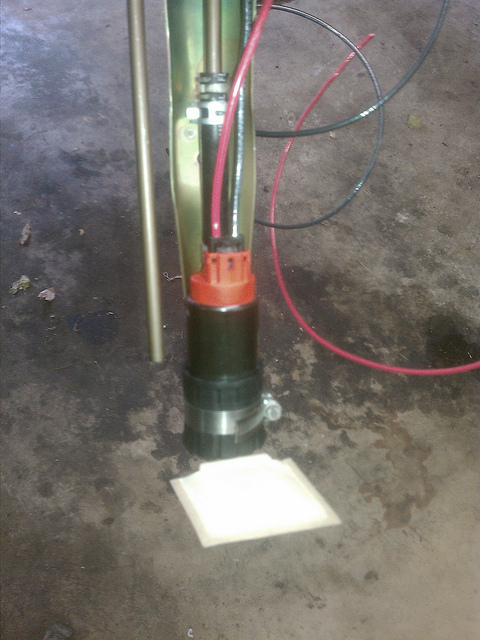 Im running 550, ID2000, To4s @15 psi boost and with base fuel pressure at 40, same type of pump, injector duty is 59%. That's pretty impressive with that fuel pressure. This pump sounds more and more attractive, especially given the price point on these. Plus its made in the US, in KC nonetheless. i personally like the Aeromotive A1000 fuel pump, and thats what im running to 500 hp also. Downside to that fuel pump is overheating, so you MUST run a regulator (aeromotive part also) if you are going to drive the car on the street for moderate distances. Sorry for getting off topic, but from what i understand the stealth is superior to the A1000 for both street and strip and i have seen nice custom setups for the a1000 done by Speedtek out in deer park. Lets try and stay on the one pump please. FC3S1991, why are you running two of these pumps and only boosting 15psi? What kind of power are you looking for with those injectors? to give you guys an idea I have 850/ 2000 ids, apex gt3574 turbo, looking to get 400 wrhp with out port my engine. When time comes to port engine on a rebuilt I will move to a larger turbo (maybe 500R) and look to get 500 wrhp with the current fuel set up and add a meth kit. there are 3 pumps like that.l am interested in getting one. Lol. If only that was in the description. when i started to build the motor and single turbo conversion i was planning on a setup for around 550hp, and just for the safety of having enough fuel thats why i went with dual pumps. right now the car has only a rough tune thats why im only running 15psi, i might switch the pump setup and leave 1 of the pumps running 1 hook to a boost pressure switch later down the road. personally i'd try to stick to 1 pump if and when possible. the last thing you want is your secondary pump to fail and not know it until you do a pass, bye bye motor. the 340 is plenty enough for about 600whp, if it can handle a kenne belle boost a pump then more like 800-900. downside is for anything more than 500whp you need a larger fuel feed line under the vehicle. The one I linked to is the one you want. Someone on here years ago ran 700 hp with the stock hard lines, and I have not had a problem with using just them. EVeryone should be logging fuel pressure which is easy to do with a autometer electronic fuel pressure gauge and datalogit. See picture attached. I was also doing a rewire with 10 gauge gasoline resistant wire to the pump. thanks for the pic. now i know what to order. wut is the point in rewire? Do a quick search for lots of info. The stock wiring isn't enough to get the full potential from any pumps. ReWire with a relay gets the pump more voltage so it can flow more than it would with stock wiring. for a 350WHP goal is it really necessary?